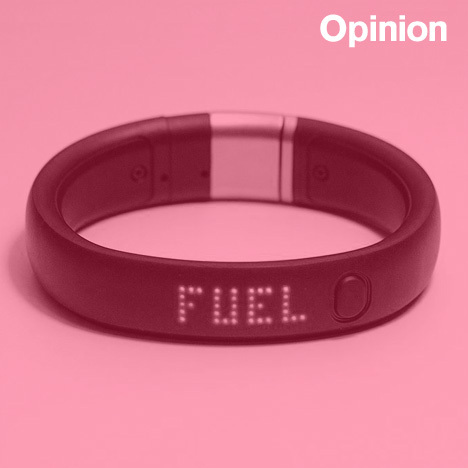 Opinion: the success of wearable technology depends on aesthetics, but with designers failing to grasp the baton can Apple make a difference with its acquisition of Beats headphones and partnership with Nike, asks Alex Wiltshire. Who would you have design a piece of wearable technology? Something everyday, something for most occasions. An object that says something about its place in culture. Beautiful, and durable. Something you want with you. Something useful. Whether you're thinking of a watch designer, industrial designer or fashion designer, chances are that they aren't designing this stuff. Wearable technology is instead largely the provenance of technology companies: Jawbone, Samsung, Google, Fitbit. And Nike. Well, until a couple of weeks ago, anyway. Having trailblazed and popularised an entire category of wearable fitness technology with Nike+ and FuelBand, Nike has bowed out from the wearables game, sacking its hardware team, to focus on making fitness apps instead. Though hardly innocent of producing the blobby rubberised forms that characterise so much wearable technology, Nike was the one company that at least has a sensitivity to style. But its move is in some ways inevitable. You probably have a device in your pocket that's capable of performing the crucial functions a FuelBand can and a lot more besides, served by apps like Moves, which has inspired Facebook to purchase it. Hardware is hard to make and service, and an area served by many other manufacturers (add to the list Garmin's Vívofit, Timex's Ironman and Casio's less slickly named STB-1000), Nike has decided that fitness tracking is about selling trainers, not transistors. Wearables are a thorny problem. It's a bit like virtual reality, in that it's a technology that everyone has assumed is the future for years, and yet somehow still hasn't quite happened. In fact, there seems to be a deep confusion over what wearables should be. How does it tell you things? Should it have a screen? How you give it commands? Does it act as some kind of support device – an external sensor or quick notifier – for a smartphone? Does it look like such established wearable tech as watches? Where do you wear it, and what does it do? And does it pose all kinds of awkward social questions like Google Glass? Indeed, like Glass, multifunctional products so far launched have hardly been warmly embraced, with battery life, looks and functionality roundly criticised. Here's The Verge's Samsung Galaxy Gear review: "Frankly, I'm not sure exactly what it's supposed to be ... Trying to please all tastes has resulted in a predictably charmless and soulless product." And Gizmodo on the Qualcomm Toq: "This isn't a purchase you should make unless you can throw $350 away on a total lark." Though reviewed quite well in the technology press, would you really want to wear the lumpen Pebble? The Pebble Steel looks better, styled more closely to a digital watch, but its functionality was on the brink of being superseded even at the point of launch. This category of technology feels like a stopgap; a timid foray into a much-vaunted next frontier for technology. It's certainly not enough to inspire the broad public to buy into it; perhaps it also suggests that the real future of wearables is something we can't yet quite grasp. Should it be founded upon completely new interaction and sensory technology? Upon real innovation? Technology commentator Horace Dediu recently proposed a taxonomy of that fearsomely overused word, innovation, proposing a scheme that goes from novelty (something merely new), to creation (something new and valuable), and on to invention (something new with potential value through utility) and finally innovation (something new and uniquely useful). So far, wearable technology has sat squarely in novelty and invention. Right now what it needs is innovation, but who can truly take up that challenge? Central to speculation about Nike's decision to let its FuelBand team go was that it was about to embark on a close relationship with Apple, especially with long-held rumours of the "iWatch", as well as various sensor improvements in the iPhone 5s and the ongoing development of Siri's voice commands. And indeed, Apple is one of the few companies to which you'd look to produce innovative wearable technology, with a knack of bringing together bleeding-edge technology and broad consumer appeal, an incredible supply chain and production capacity, and sophisticated attitude to aesthetics. Another indicator is its recent hiring of former Burberry CEO Angela Ahrendts as its senior vice president of its retail and online stores. Does this tell us something about a new ambition for Apple's commercial identity to break beyond the bounds of glossy screens and keyboards? If any company can make a universal and groundbreaking piece of wearable technology, it's surely Apple. Perhaps this is what's behind its remarkable $3.2 billion purchase of Beats just this week – it might be an established form of wearable technology, but it's also largely style-driven. Audiophiles may sneer at Beats, and Apple cultists may fret about their company spilling money over trends that it didn't create itself, but you can see Beats as a statement about the need for wearable tech to be aesthetically broadly appealing. It's certainly refreshing to see the worlds of fashion and music move into the field. But what's more broadly disappointing is that the design world hasn't jumped in, too. More than any other form of computing, wearables are all about aesthetics, functionality and technology, and objects' relationships with us as people. This stuff is bread and butter to designers, and yet currently, tech companies are being left to make all the decisions. Alex Wiltshire is a video game consultant, with clients including London's V&A Museum. He was editor of Edge Magazine until 2013 and has written for a wide range of publications including Icon, The New Statesman, PC gamer, Eurogamer, Design Week and Architects Journal.